HOT DOG DAYZ!!! 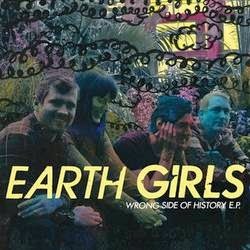 : Record Review: Earth Girls - Wrong Side of History 7"
Record Review: Earth Girls - Wrong Side of History 7"
Wrong Side of History is the debut 7” by Chicago upstarts Earth Girls. This piece of weighty green wax (via Grave Mistake in the United States) was recorded during the same session as their sold-out limited run demo cassette from earlier this year. Earth Girls are headed up by Liz Panella of Libyans and Broken Prayer on guitar and vocals. The lineup is rounded out by Joey Kappel, also of Broken Prayer as well as Boilerman, on bass, and Jeff Rice of Daylight Robbery on drums. Although the photograph that’s used for the front and the back of the jacket shows four people, Earth Girls recorded this material as a three piece, with Panella playing both lead and rhythm guitar. Eschewing the aggressiveness of Libyans or the outright weirdness of Broken Prayer, Earth Girls is quite a bit different from Panella’s other bands. These songs are a fun and soothing blend of melodic punk and sun-stroked garage rock. It hits somewhere between Radioactivity/Marked Men territory and the aforementioned Daylight Robbery, while faintly recalling ‘90s alt acts like Belly. ...Read entire review here.